Manila, Philippines - After facing some of the problems encountered by the commuters on their daily rides at the new Parañaque Integrated Terminal Exchange (PITX). 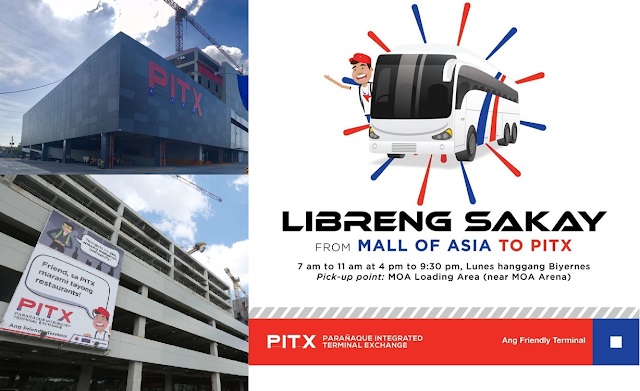 PITX through its official Facebook page on Monday, February 4, announced a free shuttle service from Mall of Asia (MOA) to the terminal during weekdays. The loading area will be near MOA Arena, from 7 am to 11 am and from 4PM to 9:30PM. PITX is the Philippines first integrated landport, which offers provincial and in-city transportation, which able passengers to transfer between Metro Manila and nearby provinces. Recently, many commuters complaining about long lines, hour-long waiting time for the next bus and luck of connecting rides from various points around the Metro.